Are your muscles aching after a hard training session? Or do you just need some relief from aching joint injuries? Well you are in the right place! 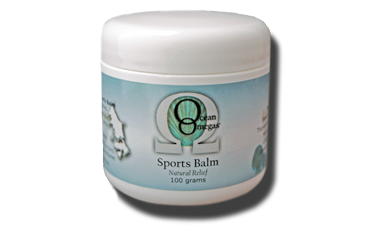 The Ocean Omegas Sports Balm is rich & deep penetrating to help relieve aching muscles & joint injuries. This sports rub is perfect for muscle pain relief and can be used like any other sports balm ointment (with better results!). Ocean Omega products provide you with the highest quality natural Omega 3 & 9 oils. Ingredients: Carnauba Wax, Beeswax, Sweet Almond Oil, Cocoa Butter, Caprylic-Capric Triglyceride , Alpha Tocopherol, Shea Butter, Jojoba Oil, Mutton Bird Oil, Tea Tree Oil, Wintergreen Oil, Camphor Oil, Eucalyptus Oil, Peppermint Oil, Lavender Oil, Cajeput Oil, Clove Oil, Cinnamon Oil, Bay Leaf Oil, Kunzea Oil. Just thought I would let you know how wonderful I think your products are. My friend purchased some at the Tasmania Craft Fair the other day and was raving about how terrific it was. Well me being the sceptic, because I have severe osteo arthritis in my hip and usually nothing I try even reaches it to give it relief, tried your products of Sports Balm, not expecting very good results. I was blown away with how fast it worked and how long I had relief for ( approx 4 hours ) which is just not heard of for me. I have just purchased my first of many of your product today. I will be raving about your products far and wide forever. Thank you for giving me the only relief from pain I have had for 13 years.